It's been a good long time since the Disney Animation Studio made a film that could not only give its property Pixar (in its glory days) a run for its money, but could also be a truly great film. While the once-unstoppable Pixar struggles to find itself again after working to appeal to a lower denominator, Disney has opted to make Frozen, a sheer delight from start to finish which reminds us that they are just as good at animation as any other studio in town. There are two princesses, the elder Elsa (Idina Menzel) and the younger Anna (Kristen Bell). Elsa is heiress to the throne, but she has a secret: she can create a winter setting (ice and snow) with the touch of her hand. As children she accidentally hit Anna with ice and nearly killed her. In desperation, the King and Queen go to the trolls for help, and secretly observing this is young ice seller Kristoff, who is 'adopted' by the trolls. The Troll King can save her, but warns the King and Queen that ice in the heart is more deadly than one to the head. After this, it is decided to keep the sisters separated, upsetting both, especially the more high-spirited and enthusiastic Anna. Three years pass. The King and Queen have died at sea by now, and after a period where the Castle was closed it is time to both reopen the gates and crown Elsa as Queen. At long last she and Anna can see each other and perhaps become close like they once were. Elsa, however, is terrified that her powers will be exposed, powers which Anna has now no memory of. Arriving for the coronation is the Duke of Weselton (Alan Tudyk), who is eager for more trade, and Prince Hans (Santino Fontana), who hits it off immediately with Anna. Knowing them less than a day, he asks her to marry him, and she says yes. This is so troubling to an already on-edge Queen Elsa that she loses control of her powers and in terror flees the kingdom. Anna, upset that she caused all this, goes after Elsa, leaving Hans in charge until her return. Now while Elsa makes for herself a castle of ice, Anna joins with an adult Kristoff (Jonathan Groff) and his sidekick/reindeer Sven, to help find her. They are later joined by Olaf (Josh Gad) a snowman from Elsa and Anna's memories who dreams of what summer would be like. After some mishaps, Kristoff and Anna do find Elsa, but in her fear of hurting anyone she does indeed strike Anna in her heart. In mortal danger, Kristoff spirits Anna away to the Troll King, where he is told that 'an act of true love can thaw a cold heart'. Believing the key is Hans, a reluctant Kristoff leaves Anna in his care. Bad move, as we get a twist in this tale. 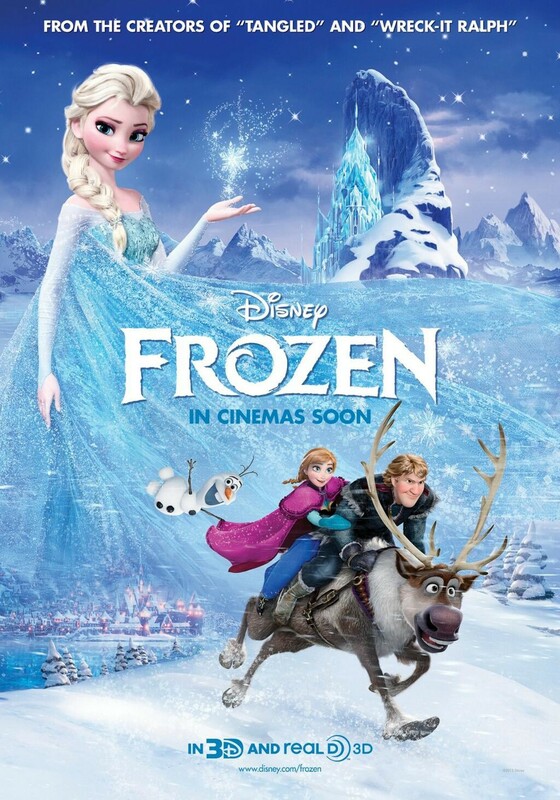 Elsa is captured by Hans, but before real harm can come to either, Kristoff and Anna come to rescue, and with the villains captured and Anna's act of 'true love' restoring things, Elsa is now able to restore the kingdom to more temperate weather (while leaving a permanent flurry for Olaf to enjoy summer). All's Well that Ends Well in this Winter's Tale. 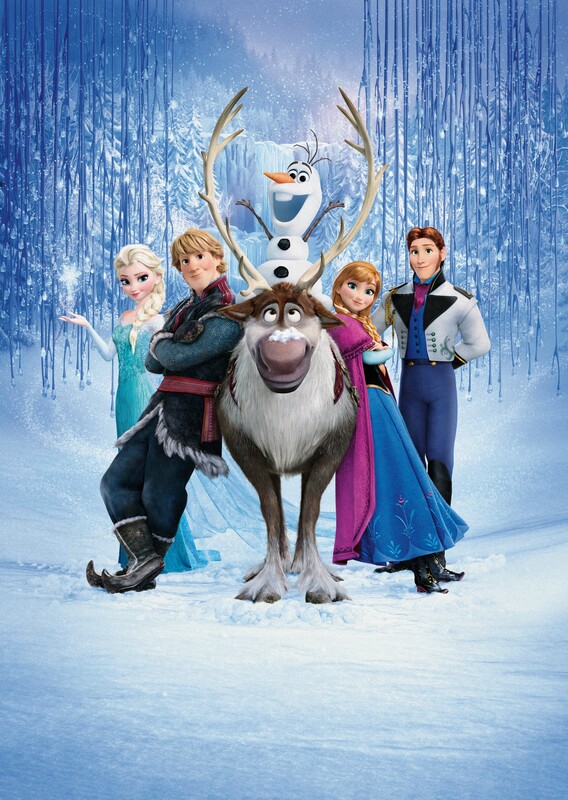 Frozen was a sheer delight and total pleasure from beginning to end. I was completely taken by both the story (and elements within it) and its complete visual beauty. The opening, where we get Scandinavian-sounding music to an amazing opening scene is breathtaking. The story itself moved remarkably fast (even with a large number of musical numbers), and there were aspects of Jennifer Lee's screenplay (who also co-directed with Chris Buck) that I thought highly intelligent. I admit I was taken by surprise to see that Anna quickly (but kindly) rejected Hans' offer to help lead the search party. It is a rarity for a Princess, especially a Disney Princess, to not let the man take the lead and go it alone, leaving the Prince (even one as hunky as Hans) behind. While I wasn't surprised that Anna and Kristoff would eventually find their way to each other, the big twist regarding one character (which I'm not telling) did surprise me. Also, the balance between the tension of searching for Elsa, who is inadvertently dangerous, and the humor from Olaf and Sven is kept throughout. We don't get an oppressively dark story but we also don't get the comedic moments of the snowman who dreams of summer or the silent reindeer who has a fondness for carrots overwhelm the story either. As I mentioned, Frozen has many songs within it, but the man-and-wife team of Robert Lopez and Kristen Anderson-Lopez have crafted some beautiful songs that are both family-friendly AND intelligent. Who knew someone like Mr. Lopez, who brought us Avenue Q and The Book of Mormon (neither of which are 'family-friendly'), could craft such appropriately Disney-like songs? While the obvious big number is Elsa's solo Let It Go (which was fantastic), the songs go through all ranges, from the cute In Summer (where Olaf sings about his dreams of what summer to a snowman would be like), the endearing Love Is An Open Door (the love duet between Hans and Anna), the funny Fixer Upper (where the trolls attempt to convince Anna of Kristoff's virtues), and Do You Want to Build a Snowman?, which goes from upbeat to almost heartbreaking while telling its story. In terms of performances Frozen is excellent in that instead of getting a 'big name' to lend their voice we get actors who fit the characters. 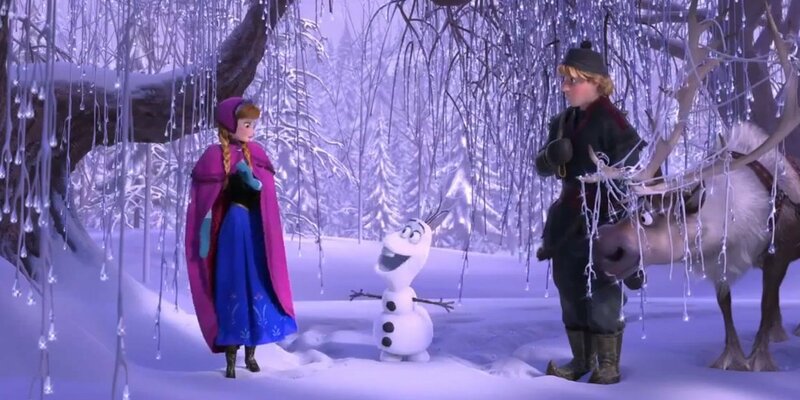 About the only 'big names' in Frozen are Kristen Bell and Josh Gad, and both are such joys as the ever-upbeat and optimistic but still courageous Anna and the goofy but lovable Olaf. It helps to have Broadway veterans performing both the big songs and the straight dialogue. Respected theatrical performers Groff does well as the reluctant hero Kristoff, but the big showstopper is Menzel as Elsa. She not only can belt out the big numbers like she did with the Oz-inspired Wicked but also make the fear Elsa has real. Christophe Beck's Nordic score fits within the winter wonderland of Frozen (I wonder whether the Norway Pavilion at Disney World will be tweaked to insert more of Frozen within it). The visuals were beautiful, the story excellent, the ultimate lesson of how 'an act of love can thaw a cold heart' a positive one. Frozen will entertain children (Olaf is destined to be beloved) and adults as well (the story of family and the songs being so well-done as to be pleasing). In terms of animation, it is good to see the Disney Studios back on their game, showing that their resurgence which began with The Princess and The Frog through Tangled continues unabated with Frozen. On a final note, this is my 1,000 post, and I can't think of a better way to mark it than with a truly great film such as Frozen. I am so thankful to all my readers who have visited to take a gander at what I think of as one of my great passions: films. It is almost five years since I opened Rick's Café, and in those years I have heard and seen the good, the bad, and the ugly. I've been reprimanded and praised, scorned and lifted up. I know that I will continue to work to talk about movies, good and bad. You may not always agree with my conclusions, and on occasion I may make a mistake or three. However, know this: I appreciate the fact that I am allowed to write about something I genuinely love, and hope that in my small way, I have led people to good movies, away from bad ones, and learned from each other. To All of You, From Me, a Most Humble Thank You.